Almost every time I use it, I think, 'Wow! 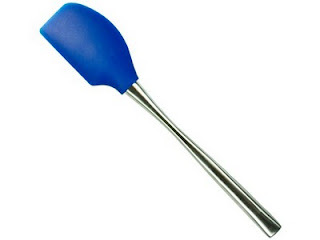 This is one of my favorite kitchen tools!" I like it that much. I've used other spatulas, but totally, this one rules over them all. And why did I pick it? It was blue. And had a stainless steel handle. After the fact, I discovered that it was a recommended spatula by America's Test Kitchen and Cooks Illustrated. I totally get why.